As we draw near to the end of this 31 Days of Challenge, I am humbled by God’s goodness in enabling me to post daily. It has been my joy to contemplate the life of Brother Lawrence, to practice the presence of GOD and to create collages that reflect my love for Him. Today, I had little time to pull the collage together, so I returned to the habit of quickly choosing about 7-10 images to see where they’d take me. I definitely sensed a pull towards preparing for Advent. The past few years my reflections of Jesus’ birth have occured beneath the shadow of the Cross. So, it didn’t surprise me that a picture of the communion elements made their way into the collage. God prepared the way for us to come home. To return to a deep love relationship with him. God longs to plant in us a deep assurance of His love. He understands our struggles, because Jesus, Himself suffered. 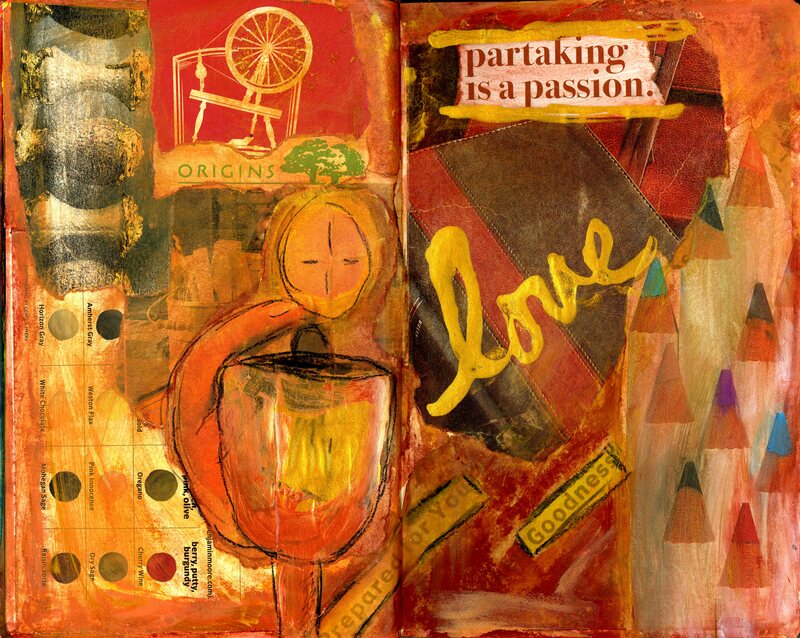 The phrase “partaking is a passion” resonated with me because the root meaning of passion means to suffer. Passion is a paradox, because we think of it as that thing which drives us to accomplish our hopes and dreams, but fulfillment of these comes through hard work and often suffering. And ultimately Jesus’ suffering on the cross made it possible for us to dream at all, and to enjoy the grace He has bestowed upon us. Brother Lawrence was no different than us, he suffered physical pain and soul anguish. He fought in a war, he injured his back and he did menial work. He doubted his salvation to the point, he wasn’t even sure of his future in heaven. He struggled with these doubts for four years. He sought God despite his doubts and fears. God has always loved us. He prepared for us, GOODNESS! Salvation through His only Son, that’s the season we are entering. A time to remember, to rest, to rejoice in Jesus’ completed work on the Cross. Did you know that GOD loves you with all His heart and all His soul?